West Ham winger Victor Moses has reiterated his commitment to Nigeria after he was accused by fans and local media in Nigeria of putting club before country. Moses, 25, starred as Nigeria clinched the 2013 Africa Cup of Nations, but his search for consistency on the international scene has been hampered by a series of niggling injuries. His last Super Eagles appearance was in the 2-0 loss to France at the 2014 World Cup but he insists his commitment to Nigeria should not be questioned. 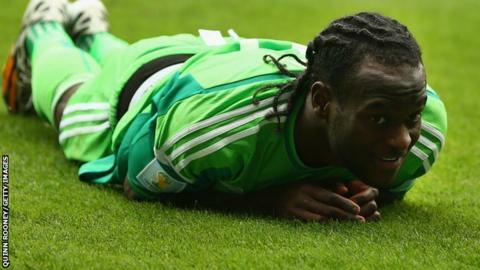 "I'm proud of being a Nigerian international and am always committed to playing for my country," Moses told BBC Sport. "It's the best feeling representing your country and I always want to perform and give 100% for the team. "Unfortunately, I have not been able to play due to injuries but I have an unwavering commitment to Nigeria." Moses' debut and last international appearance came under Stephen Keshi, who was fired after the country failed to qualify for the 2015 Nations Cup. Keshi's successor, Sunday Oliseh, said Moses remains part of his plans despite pulling out of crucial friendlies against DR Congo and Cameroon last October. Oliseh's comments were a timely boost for fit-again Moses who has played in West Ham's last five matches after recovering from a hamstring injury. "There is a new manager and the team has been doing well but without me," said Moses, who misses the involvement. "I'm prepared to give it my all and fight for a place on a regular basis, that's my aim. "This is football, a competitive stage and I have to fight hard to get in but I don't mind doing that." Former Crystal Palace and Wigan player Moses joined Chelsea in August 2012, but has spent the past two seasons on loan. Moses, who also had loan spells at Liverpool in 2013-14 and Stoke last season, moved to West Ham on loan in September 2015 after signing a new four-year deal with his parent club. At international level, he committed himself to Nigeria despite having represented England at junior levels, up to the Under-21 team.